Imaging departments adapt to the mandate, but questions persist. Although it went into effect in January, the rule requiring compliance with the National Electrical Manufacturers Association's XR-29 standard poses unanswered questions for health care providers and vendors. The rule, which was mandated by the Protecting Access to Medicare Act of 2014, stipulates that all CT scanners that are used for Medicare-reimbursed outpatient diagnostic CT must be compliant with XR-29. Scans performed on noncompliant scanners are assessed a 5% penalty on the technical component—including the technical component of a global fee—of any diagnostic CT performed at imaging centers, physician offices, and hospital outpatient settings. If the facility bills for both inpatient and outpatient scans, only outpatient scans are subject to the reduction. In 2017, the penalty rises to 15%. There are four standards within XR-29 that need to be addressed. The first is that the scanner must support the DICOM Radiation Dose Structured Report (RDSR) to enable dose information to be captured in the patient record. The second standard is a dose check feature that alerts technologists before a scan if the estimated dose index will exceed an established threshold. This feature will also stop a scan if dose thresholds are exceeded, requiring the operator to provide login credentials to continue the scan. The third standard is an automatic exposure control feature that automatically adjusts dose during a scan based on differences in radiation diffusion in different organs. The fourth standard is a requirement for preloaded reference and pediatric protocols to standardize the scans. "If you were to buy a CT scanner today or bought one within the last few years, very likely you have all of these things," says Tessa S. Cook, MD, PhD, an assistant professor of radiology, chief of 3D and advanced imaging at the Hospital of the University of Pennsylvania in Philadelphia, and a member of Radiology Today's advisory board. "If not, you're probably looking at a firmware update of some sort or, depending on how old your scanner is, you may need to buy new equipment to be compliant." How facilities manage the necessary upgrades and purchases varies. A survey released by the AHRA, the Association for Medical Imaging Management, on March 9 of this year found that more than one-third of respondents' facilities were not fully compliant as of January 1. While 249 of 425 respondents reported being fully compliant, 120 reported being partially compliant, and 56 reported being noncompliant. Among the partially compliant group, 56 reported having one noncompliant scanner, 21 reported two, 12 reported three, and 10 reported four or more. The rest did not report a number. In a follow-up question, 86 of 113 partially compliant respondents said they would be fully compliant by January 1, 2017, while 27 said they would not. Ernesto A. Cerdeña, PhD, RT, CRA, FAHRA, FACHE, president of AHRA and the director of radiology and clinical laboratory services at Waterbury Hospital in Waterbury, Connecticut, says facilities with equipment that can't be upgraded face a difficult choice if their CT scanner needs to be replaced. "The challenge is really the capital cost because it takes preparation, business plans, justification, and approval before you can get the money," Cerdeña says. "The dollars are stretched; there are other competing priorities within the hospital, and $300,000 or $400,000 is difficult to get." Another challenge, Cerdeña says, is operational. Noncompliant studies need to have a modifier attached when they're submitted for reimbursement; the modifier is "CT." This adds an extra administrative burden. "We have to work with the business office, the billing and coding, to make sure that it's captured," Cerdeña says. "We need to pay really close attention to that, especially the technologists who are performing the test, to make sure that they do alert the business office every time they perform an outpatient scan utilizing a noncompliant scanner." Waterbury Hospital has upgraded two of their three scanners, but the third will have to wait. Cerdeña says they will absorb the penalty until they are able to upgrade. The most useful way to think about the cost, he says, is to compare the money that's lost with the cost of an upgrade or a new machine; the volume of outpatient Medicare scans should provide a good gauge of the return on investment (ROI). "If we were a small office that did a small number of [outpatient Medicare] CTs per day, it might be worth it to take the penalty," says Victor Sarro, administrator for radiology at Thomas Jefferson University Hospital in Philadelphia and a member of the board of directors of the Association of Administrators in Academic Radiology. "You'd have to run an analysis. You lose 5%, but it's only on the technical side. Medicare only reimburses in the high $200s, maybe $300 [for an outpatient diagnostic CT] so you're going to lose maybe $15 [per scan]. But if you're only doing three CT scans a day, that's $45. If it costs $100,000 to upgrade the scanner, how long is it going to take [to get the ROI]? If I have to buy a new scanner because mine's not upgradeable, is it worth it? But then next year it goes up to 15%, and that may be the tipping point for some people." Thomas Jefferson upgraded four of their five CT scanners; two were done automatically by the vendor, and two required the purchase of additional hardware and software. Sarro says Thomas Jefferson's volume of outpatient imaging made the cost of the upgrades worthwhile, and the radiology department wanted the RDSRs. The remaining scanner isn't used for outpatient imaging. According to Judith Schmalzing, CT product manager at Siemens Healthineers, shifting equipment use to avoid penalties is not uncommon. "There are some providers, especially if they have more than one CT installation or a mixed fleet of compliant and noncompliant scanners, who don't necessarily see the need to upgrade as urgently because they try to triage their Medicare outpatient procedures from a noncompliant scanner to a compliant scanner," Schmalzing says. "They may use their noncompliant system exclusively for inpatient or interventional CT procedures, which are not affected by the penalties but, in turn, it may be a big operational challenge and add the additional costs of monitoring the patient flow and making sure that you have appropriate billing." Another option that some facilities are pursuing to bring their scanners into compliance is the use of third-party solutions. CareMount Medical in Mount Kisco, New York, is a 500-physician multispecialty group that performs between 30,000 and 40,000 CT scans annually. John Basile CRA, RT, (R)(MR), administrative director of radiology at CareMount, says two of their CT machines were XR-29 compliant, but they were unable to get the original equipment manufacturer (OEM) to upgrade three others. "We absorbed the 5% penalty on studies from these scanners, starting January 1," Basile says. "However, we don't want to continue with the subsequent 15% penalty being applied next year, so we needed a solution that could address XR-29." The solution that CareMount chose is SafeCT-29 from Medic Vision. SafeCT-29 is the only third-party XR-29 solution that is FDA approved as a Class 2 medical device. The system is a standalone machine that is tethered to the CT scanner. It can perform all of the required XR-29 tasks, but it does not use any of the CT scanner's resources and functions independently, says Eyal Aharon, CEO of Medic Vision. Aharon says his company has installed more than 40 units and has orders for more than 100 additional units. Basile says the scanners are functioning compliantly, and he has turned his attention to ensuring that the dose data will consistently transfer to CareMount's speech recognition system—the organization uses PowerScribe—as part of every report so that those reports, containing the associated dose, will carry forward into the EHR as an automated component of the patient record. His goal is to eventually track cumulative patient dose. Although XR-29 does not require cumulative dose tracking, Basile feels strongly that it will be required in the future. "We're all going to be tasked, eventually, with figuring out the cumulative aspect of dose originating from all ionizing modalities," Basile says. "Where, how, and when that's going to be required remains to be seen." One of the criticisms of XR-29 is that it doesn't define what to do with the RDSRs. The reports are not required to be used or saved. "You can just generate a report and delete it afterwards. That's OK from the standard's perspective," Aharon says. "If the industry is already putting the investment and effort into getting those dose reports generated, I think that it only makes sense if [they are sent to a national registry or archived by the health care organization]. I think that it's really a shame that you already have this information, but you don't have to keep it and use it." Another difficulty with XR-29 has been the dose check feature. Although the feature was mandated, in part, as a response to some egregious cases of radiation overexposure, and most people agree that it is an important feature, it has caused some workflow difficulty. "Clinically, the greatest adjustment is with the dose check feature. I have listened to some lectures at various industry symposiums that [describe how] this feature is causing some pain, if [organizations] are employing the locking protocol," says Brent Christenson, senior field marketing manager for CT at Philips. "The challenge is [particularly with] incidents [that happen in the middle of the night] when the night shift needs the password to do a scan and everyone is asleep. Unfortunately, the solutions include turning off the locking protocols, which then eliminates the benefit of eliminating unapproved overexposure. Thus, the tools of XR-29 are only as effective as how they are implemented and used." The biggest problem with XR-29, however, is a lack of guidance regarding how compliance should be demonstrated. While the technical aspects of the mandate are well established, the compliance verification question has caused a great deal of confusion. The Centers for Medicare & Medicaid Services (CMS) does not mandate any sort of equipment testing; all that's required is a certificate saying that the machines are compliant. "It's different from the ACR accreditation process, because to apply for ACR accreditation, you have to submit a certain number of scans and certain examples and make sure that your CTDIs [CT dose indices] are below a certain threshold," Cook says. "There are specific requirements that have to be met. It's possible that this may go in that direction in the future, but we don't know." To add to the confusion, there is no agreement about who can issue a certificate. This leads to questions as to whether only OEMs can provide a certificate of compliance or third-party vendors can certify compliance, as well. The regulations are unclear. When asked to clarify this point for this article, CMS did not respond. "I talk to customers, and they are confused because they hear all kinds of messages from different people. And I think there's a missing statement [that would clarify the certification requirements]," Aharon says. "And it should be someone without an interest because the OEMs will be happy to tell you that only they can certify, and I will be happy to tell you that only I can certify, but that's not really true. Someone from the government has to stand up and say, 'This is what's needed, and this is what's acceptable.'" Despite the changes it mandates, XR-29 may not be well known outside of the radiology administrators who are tasked with implementing it. Cook says approximately one-half of the people who signed up for a Society of Imaging Informatics in Medicine webinar in July that she copresented knew nothing about it. 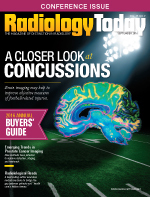 Vijay M. Rao, MD, chair of radiology at Thomas Jefferson and chair of the RSNA board of directors, thinks XR-29 may not be a prominent topic of discussion because it's a local issue within each health care organization. Rao says she has heard about it through her work with RSNA and because she leads her hospital's radiology practice, but she suspects that many radiologists who aren't practice leaders have never heard of it. Even though it is not well known and not as specific as some would like, however, Rao still believes that it's a worthwhile effort. "I think it's a very important initiative, and it's much needed because, unless there are mandates, a lot of these types of issues don't really get addressed," Rao says.